SPIN! Is hosting a series of pint and pairing nights featuring Nebraska Craft beers. The Papillion Pizzeria has teamed up with several local brewers to create a fun, frothy event. For a full schedule, visit http://www.spinpizza.com/nebraskafest and head to SPIN! 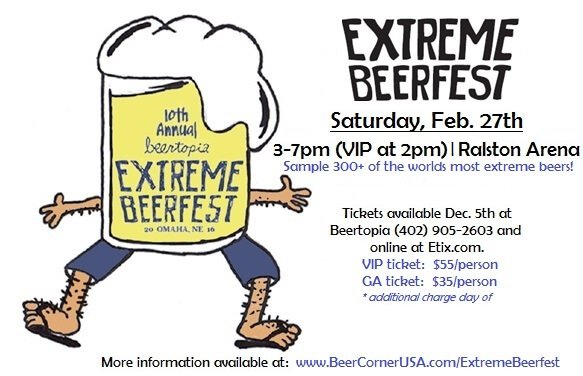 Extreme Beer Fest tickets go on sale December 5. The event, which takes place at the Ralston Arena February 27, will feature over 300 different beers, as well as a home brewer’s expo. The two day hop-stacle course will offer general admission, VIP, and a weekend dinner + festival combo pack. Tickets are available at ETIX and Beertopia. It’s time to sign up for your Winter CSA at Tomato Tomato. The 8 week share begins January 8, and includes protein (beef, chicken or pork), grain, greens, cheese and dried beans. There also is a vegetarian option with more non-meat proteins and greens included. Other shares include weekly bread and organic egg pickups. Don’t let the snow come between you and fresh, organic food grown locally with love! To learn about local growers, shop, and sign up for your CSA, visit the website at http://tomatotomato.org/ or stop in Thursdays, Fridays, and Saturdays at Tomato Tomato. Award winning Chief of Community Health and Nutrition Services with the Douglas County Health Department, leader in the local food movement, and champion of women and children’s health and wellness Mary Balluff is celebrating her retirement this month. Omaha is a better place because of her tireless service, and everyone at The Reader would like to extend our gratitude and congratulations to Mary!